(2) Léon Humblot, the "White Sultan" was a French trader, who in exchange for his assistance, obtained in 1885, from Saidi Ali, the "Black Sultan" a large concession covering "as much lands as he could exploite" (in fact the whole island) In 1887 he became director of the newly established Socièté de la Grande Comore - Léon Humblot et Cie, which was also granted some administrative tasks. When he was also appointed resident in 1889 he became the real ruler of the island until 1896 when he was deposed. In 1897 the powers of his company and the extension of its concession were also somewhat limited, but it was only in 1912 that it lost its last administrative powers. 1892 - 1893 Saidi Ali Bin Saidi Omar, forced to abdicate (4) s.a.
(3) It was probably now that Saidi Ali started to use the English style of "King of the Comoro" and that he also started claiming the islands of Anjouan and Mohéli. (4) At the moment of his forced abdication he transferred all the powers invested in the dignity of Sultan to the French resident. In 1909 a French court decided that the deposition of Saidi Ali had been illegal. He was however not allowed to return and received a financial compensation. - Dimani : sultanate subordinated to Itsandra. Seems to have had a very brief existence in the early times. - Hamanvu : sultanate existing briefly in the early days. - Itsandra : major sultanate, one of the two leading sultanates of the confederation. Co-rulers didn't usually rule at the same time but succeeded each other in a yearly (?) rotation. -Mzade Badgini° (Mzade binti Mugné Mwembwani)(until 18..) She succeeded Umam wa Dari, who reigned (1852-84) and was succeeded by Khadija. 1884 - 188. Khadija binti Mugné Mku° (5) s.a.
1885 - 1887 Hachimu bin Mugné Mku s.a.
1887 - 188. Khadija binti Mugné Mku° s.a.
1889 - Hachimu bin Mugné Mku s.a.
(5) It's not clear what happened to Khadija after Hachimu seized power in 1885. After he had been driven out in 1887 she was first arrested but later reinstalled as Sultane by Saidi Ali and the French. Later she is known to have been in exile (in 1888) and to have joined Hachimu in 1889. As to Hachimu himself, he was never formally recognized as Sultan and was always in revolt against Saidi Ali. He tried to convince the French to consider Badgini as a separate protectorate but they refused. In 1886 he also tried to place Badgini under the protection of the Deutsche Ostafrikanische Geselschaft. At first the Germans accepted, but when Karl Wilhelm Schmidt (1... - 1...), the agent of the company in Badgini learned that Hachimu was only a rebel fighting the already existing French protectorate they withdrew. 1881 - 1882 Saidi Ali bin Saidi Omar s.a.
(6) At some time in the fifties Mugné Mku associated his sons Saidi Bakar (1... - 1...) and Mohamed (1... - 1...) and his son-in-law Mugné Mugi (1... - 1...) to the throne. In the sixties they were deposed following a revolt and since 1867 Mugné Mku again ruled alone for a time. Later they were however again mentioned as Sultans and during the last years of the reign, Mugné Mugi seems to have been the major ruler. 1870 - 1871 Mussafumu bin Fey Fumu (2x) s.a.
1871 Tibé Bamba Sujaoma(2x) s.a.
(8) Fumu Mwanda was also the last sultan of Oichili, so it's possible he ruled untill 1892. 1872 - 1873 Singa Madi Jimba "Aicha"° (2x) (9) In 1873 she was taken as a captive to Itsandra.. As she was however treated well and even married Mussafubu it is possible that she has continued to be Sultan in Name. In this case her successor, Jumbe Boina Fumu, was possibly only a kind of governor. 187. - 18.. Singa Madi Jimba "Aicha"° (3x) In 1880 she submitted to Saidi Ali of the Comoros. She was succeeded by Jema Niema bint Jumbe Fumu at a not known date. (9) In 1873 Aicha was taken as a captive to Itsandra. As she was however treated well and even married Mussafumu it's possible she continued to be Sultane in name. In this case Jumbe Boina Fumu was possibly only a kind of governor. 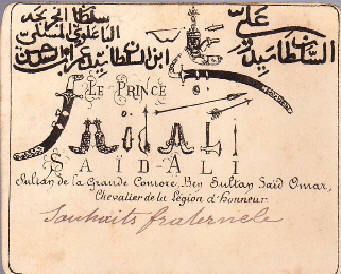 In 1880 she submitted volontary to Saidi Ali. 1881 - 188. Mouna Chamou bint Mugné Mku° (2x?) It might have been her second reign. She was succeeded by the male sultan, Bwana Fumu, who reigned until 1888. 1889 Alidi bin Mugné Mku s.a.
1889 - 18.. Saidi Bakar bin Mugné Mku s.a.